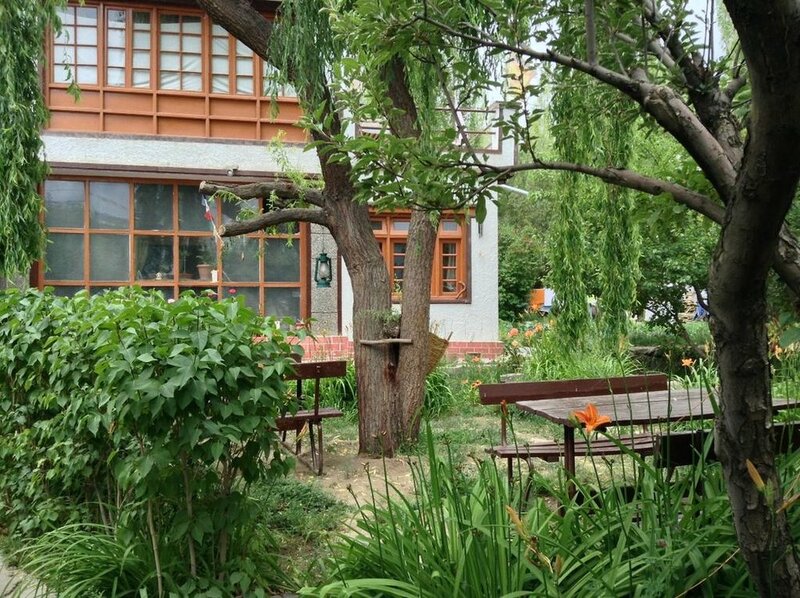 The homestays are run by local families. They are simple but very charming in Tibetan style. 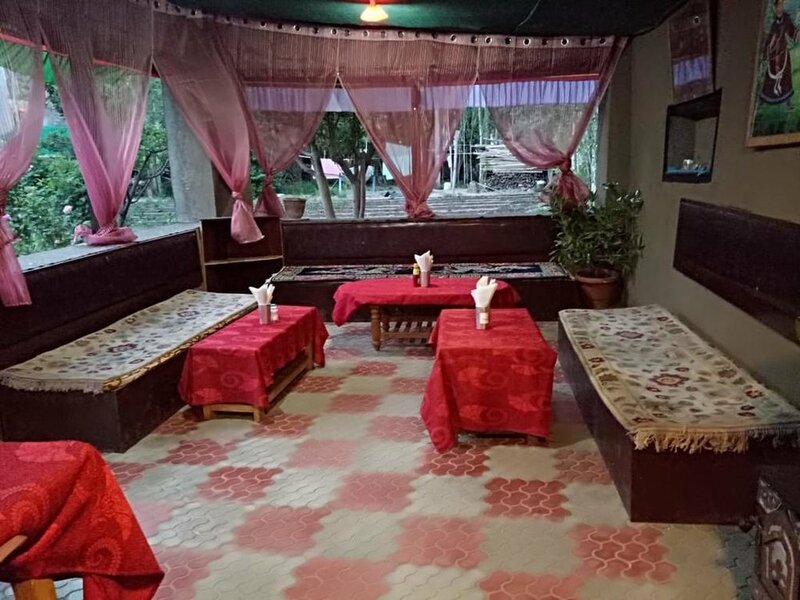 The centre of the house is a big room with a cooking place where we sit on the floor and enjoy our home cooked meals and community. There will be boiled spring water to drink. You will sleep in simple but clean and comfortable rooms lit by candles or solar light. 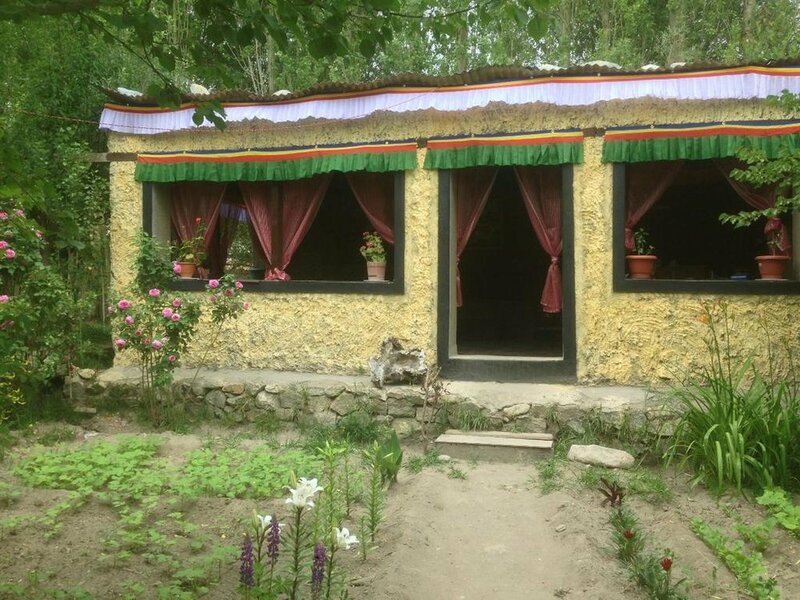 They are furnished in traditional Ladakhi style. 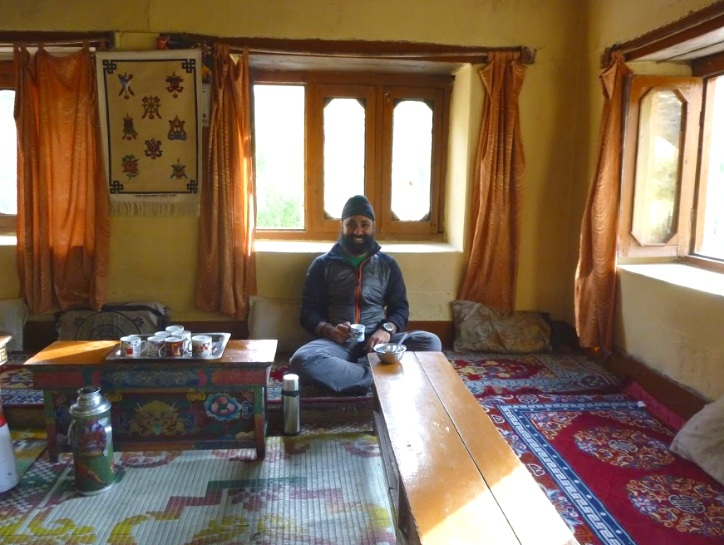 By staying with the locals of Ladakh we help them generate income from tourism activities. Arrivals at Delhi - From Delhi airport you can take an inland flight to Leh Ladakh (about 1 hour). From Leh Airport you will be picked up and brought to our accommodation. We suggest you to make your bookings well in advance and we also highly recommend you a travel insurance. (Reiserücktrittsversicherung). Day 2 (July 8) : Breakfast. Flight to Leh (3500m). Pick up from airport - brought to Guest house. Acclimatisation. Official program starts at 17:00 h. Welcome dinner. Day 3 & 4 (July 9, 10): Acclimatisation in Leh - short walks in market, visit to Shanti Stupa, Museum, local Handlooms, Leh Palace. Day 6 (July 12): Drive to starting point of our Trek. 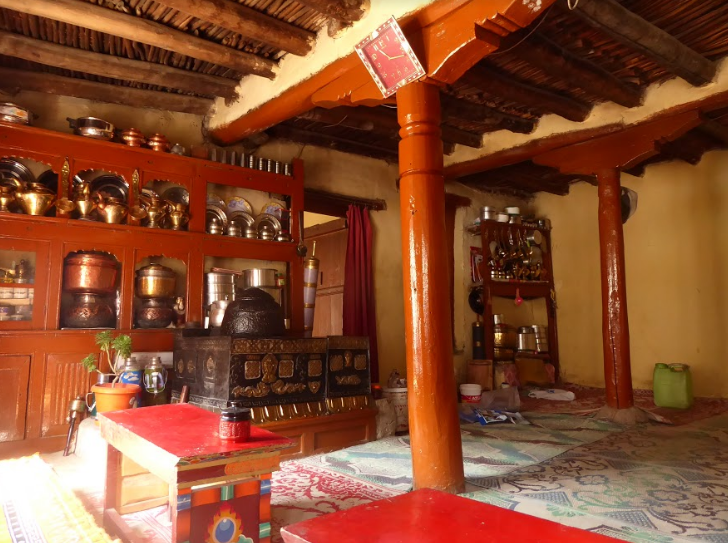 Visit the oldest monastery in Ladakh, cooking course. Overnight in Homestay. Day 7 (July 13): Morning Yoga, Trekking (c.a. 4 hrs)- day activities - overnight in Homestay. Day 12 (July 18): Breakfast, departures from 11:00 hrs. Program ends. * Changes may be made to the program, but no major changes are expected. 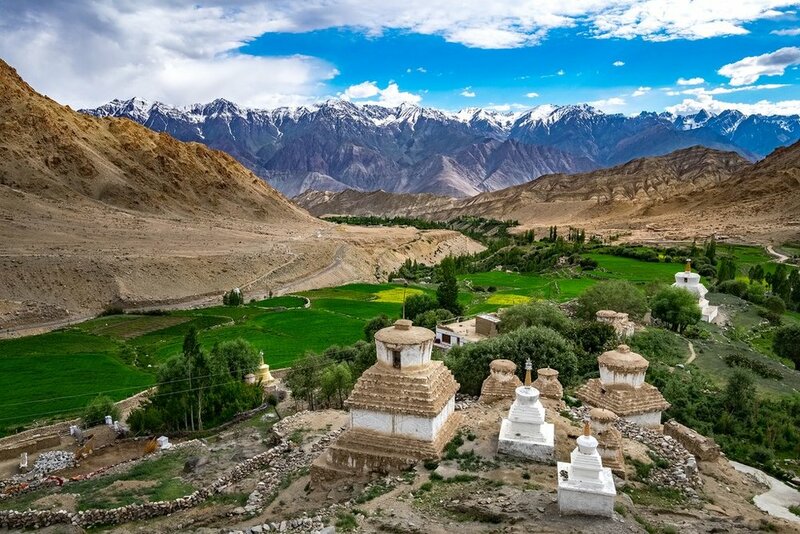 Ladakh, meaning land of high passes, is famous for its remote mountain beauty and its closely related culture and history to Tibet. 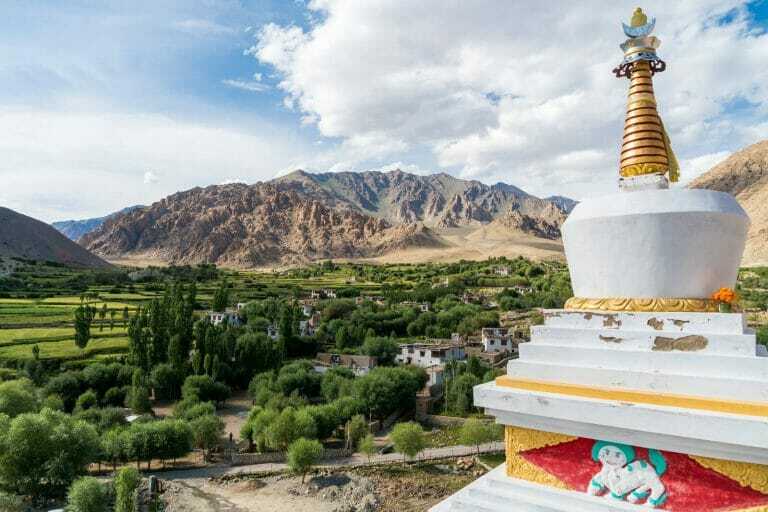 Leh, the main city is situated at 3500m above sea level nestled in the great Himalayan, Karakoram, Zanskar and Ladakh ranges. Buddhist pilgrims settled long ago in the area and Buddhism is the main religion so that it became home to many beautiful monasteries. We are happy to bring our first ever retreat in this special part of India in the summer of 2019. 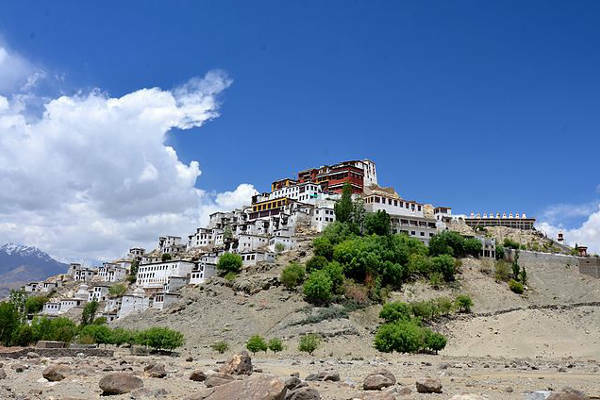 Explore the beautiful town of Leh, the culture and its local people. Acclimatizing in Leh for some days and visiting the local monasteries, the museum and experiencing the wonders of Ladakhi kitchen. 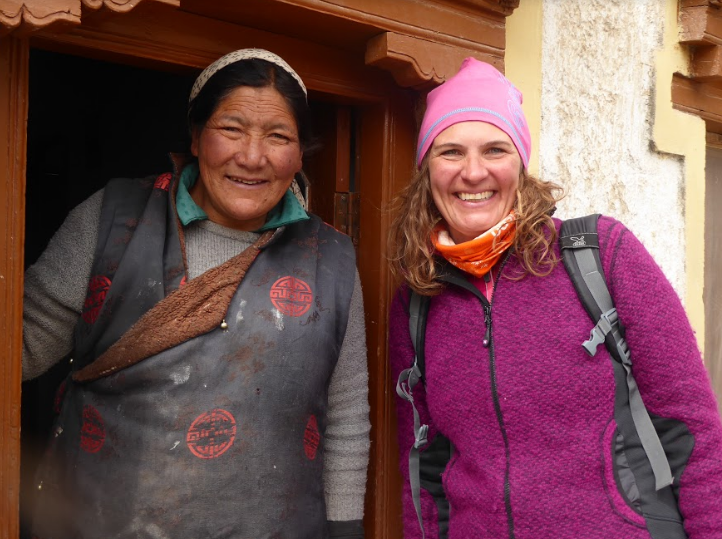 We start our trek after acclimatization for a few days and stay with the locals in homestays enjoying the hospitality of the simple people our retreat in this unspoiled wild mountain environment. The trek offers deep cultural and nature experience, community interaction; combined with Yoga practice and joys of simple living. The mountains of Ladakh are home to many animals that have adapted to the cold in different ways. Many of them are endangered such as the snow leopard and the Tibetan wolf. More visible are the Blue Himalayan Sheep and the Ibex in these regions. 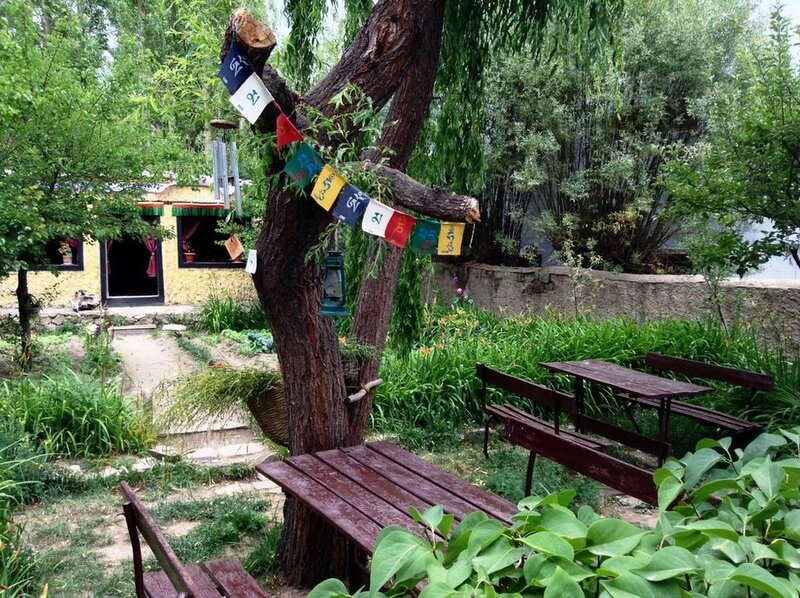 We also taste the finest apricots of the world in Ladakh. This retreat of ours is a give back retreat. Whenever on our retreats we would like to help local communities, either by including service opportunities or sharing a part of the profits from us, thus doing even a little from our side. Traditional Ladakhi food is very delicious and at the same time healthy, nourishing and mild-flavoured. They are famous for their butter tea and a Kashmiri spiced aromatic tea, Kahwa, is one to definitely try. Part of the experience is also to learn some authentic traditional Ladakhi recipes during our cooking class in the famous monastery of Alchi. The retreat features daily yoga classes led by Gurdeepak and Steffi. Yoga classes are offered in a way to relax, connect with yourself and stimulate to grow in our own personal practice. Classes are for all levels of asana practitioners. Yoga asana classes will begin in the mornings and sharing the philosophy during the day. 12 days / 11 nights (Jul 7 - Jul 18). Arrivals on Jul 7 in Delhi. 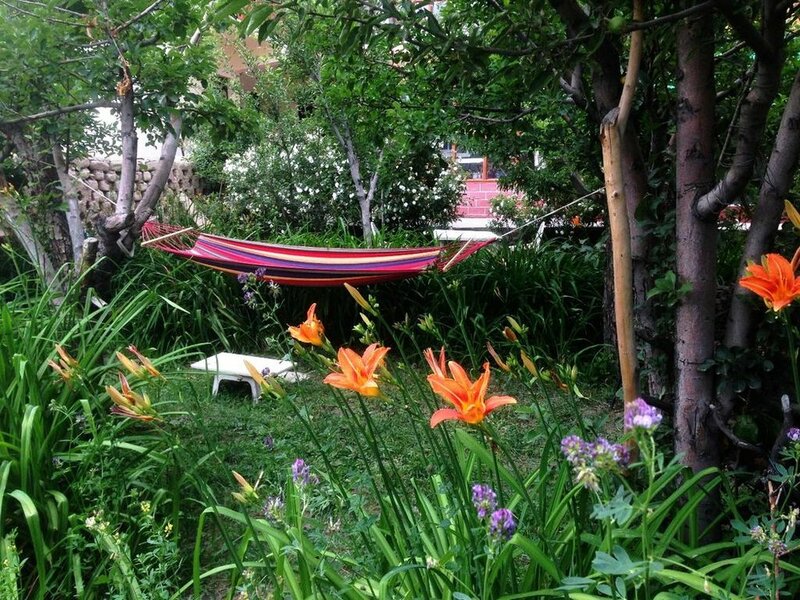 Inclusive retreat price: CHF 2500-. Deposit to hold place: CHF 800-. * participants traveling alone will be matched up with other participants depending on the profile. ** final balance is due 60 days before the retreat start date. Read the full cancellation policy in our full terms and conditions sign up form. VISAS ARE EASY. THEY ARE REQUIRED FOR ENTRANCE TO INDIA, BUT IT IS SIMPLE FOR MOST VISITORS TO RECEIVE A TOURIST VISA ONLINE. VISIT THE INDIAN GOVERNMENT WEBSITE HERE FOR DETAILS, AND CONTACT US WITH ANY QUESTIONS.